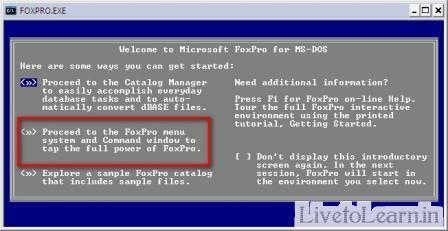 FoxPro Commands - Part 1 | Live to Learn! 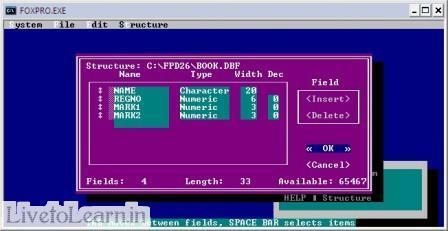 Unlike other RDBMS systems, in FoxPro each database can contain only one table. To close the current opened database. To close the all opened database. Append is used to add the new record. - To add blank records. Used to display the particular record. Display All Records in page wise. 9. To display the status of the system memory variables. - It list all the records one by one for editing. EDIT FOR empname = "LEELA"
After using the delete command the records marked with * (asterisk) mark, i.e., marked for deletion. - It is used to recover the deleted records. - To delete the records permanently. It is used after the delete command. - It can be used to empty the record instead of deleting.